The vernal equinox. Herald of spring, bringer of long balmy days, ancient druidic corner stone of the cycle of nature and a sure sign that your garden is about to be filled with glorious scent. I love this time of year, not just because the days are finally drawing out and the weather is (in theory) getting just a little bit warmer but because now is one of the best overlaps in the gardening calendar. As usual at this time of year, we are still seeing the last of the winter plants; some winter flowering honeysuckle is still flowering and the hamamelis is having its last show as they reach the tail end of their flowering season. That sweet, spicy fragrance of the hamamelis is a favourite of mine, but at this very special time of year that seasonal scent is not alone. This is because right now we start to see the first flowers of spring, which bring with them a very different pallet of scents. Unlike the strong, rich scents of winter these sudden newcomers are all about colour, freshness and vibrancy befitting their patron season. Of course the first of these is that iconic symbol of spring – the daffodil. A sweet, yet subtle scent that evokes a feeling of renewal. Of the spring flowering bulbs, the scented narcissi are some of the first and best for scent and it’s flowers like these that give the spring side of things some oomph. 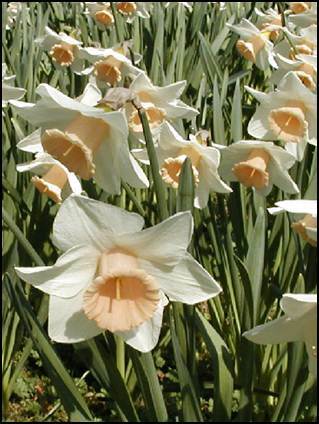 Not so much from your standard yellow daffodil but some of the hybrids have been bred with enhanced scent. These are wonderful if planted in drifts. Add to that the heady, powerful scent of hyacinths and something magical happens. With the last of the strong, sweet scents of winter fading away, these first spring fragrances are welcomed with the result that you can actually smell the seasons changing! To add to this sensory delight, the buds are about to burst on the viburnums which fill the air with an intoxicating heady scent. As there is a particularly favourite variety just outside my office window, I look forward to this every year. As spring moves on and really takes hold this exciting transitional period will fade into spring in its full magnificence (or at least I hope it will, who knows with the weather as changeable as it is) bringing the next wave of spring fragrance in the form of sweet violets; primrose and eventually the first of our tulips. It is my favourite season (actually. I say that every season!). Such a wonderful time of year to be out in your garden. So shake off that hibernation grogginess, get out there and inhale the new season!